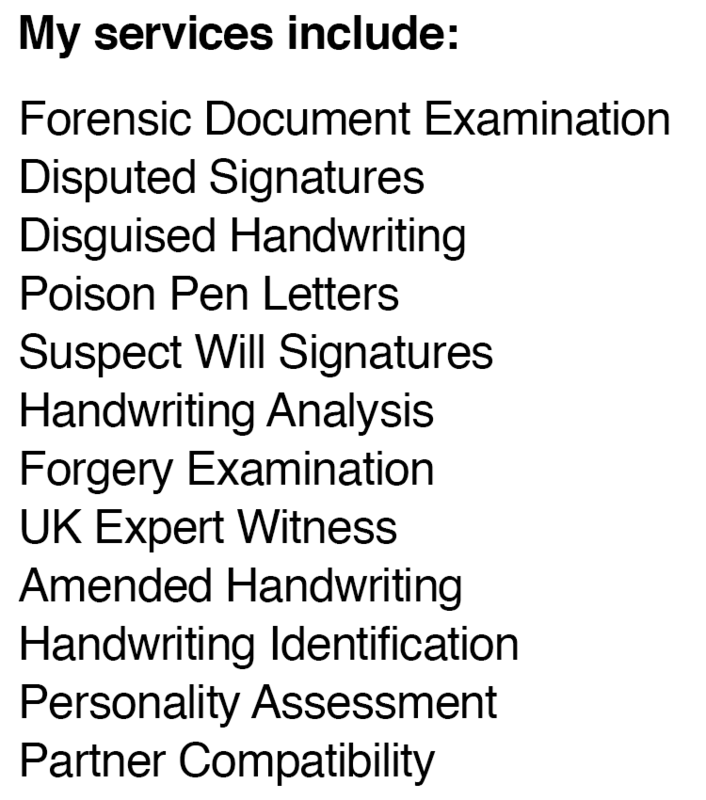 Ruth Myers ABFHE WADE CGA, a leading forensic handwriting analyst (graphology), provides a fully qualified handwriting analysis service. See here for terms of business. Using proven scientific techniques, Ruth's handwriting service assists in personality analysis for business, personal requirements and suspect document examination. Her skills have landed her on television, radio and print media. Click here to view past clients. Many Corporate and Private Companies including Banks, Building Societies, Insurance Companies, Financial Institutions, Solicitors, Media Groups, Arbitrational Tribunals and the Crown Prosecution Service have taken advantage of Ruth Myers' expert forensic handwriting analysis skills. Character Assessment - Analysis of personality traits from a handwriting sample. Self-improvement - handwriting analysis, or graphology, can reveal hidden talents, certain qualities you could use for personal improvement and gain. Forensic graphology for identifying falsified documents and examination of poison pen letters etc. Relationships - does your partner's handwriting say something about them you should know? What about your colleagues? Media Services - handwriting analysis of public figures and entertainers. After Dinner Speaking - an informative, but entertaining approach to handwriting analysis. Exhibitions and Corporate Events - with audience participation these events are both an interactive and memorable occasions for client and guests alike.